On an overcrowded and overheated Earth, humanity squabbles over scarce and rapidly diminishing resources, goaded by politicians in thrall to businessfolk who take orders from the gods created by their own delusions. That is surely the only way sane folk can interpret deforestation, the rapid depletion of non-renewable minerals and energy resources, impoverished tenant farmers growing cash crops for export rather than food for their families, the manufacture and worldwide distribution of non-essential knick-knacks and the obsession with celebrities dressed in tawdry fashions. This post is as a year round links resource for all those Indonesians and friends of Indonesia wishing to protect, preserve and enhance Planet Earth for future generations of all species. Any omissions are a result of poor telecommunications rather than deliberate choices. Please email me with details of those Indonesian organisations you feel should be included, preferably those with an internet presence. To help people understand our interconnectedness with nature and to support safe and sustainable lifestyles. 1. To learn from existing community-based knowledge and use this knowledge to develop appropriate methods of preserving and strengthening local resources while strengthening community resilience to disaster. 2. To provide access to hands-on demonstrations, information and tools that address challenges faced by local communities. 3. To develop and utilize various types of educational media to capacity build and raise public awareness about community-based sustainable development and disaster management. 4. To participate in national and international networks, which support new and existing initiatives that focus on community-based sustainable development and disaster management. 5. To provide assistance to disaster affected people in need. A self-sustaining, self-governing society that secures the health and sustainability of the natural resources and the environment while pursuing socio-economic well-being that is equitable and democratic. A global environmental think tank to form a sociaty that self-governs and secures the quality of its natural resources and environment while pursuing socio-economic well-being that is equitable and democratic. An independent research institute with national and international reputation that becomes a reference and a pioneer through its studies and advocacy on strategic issues. Links to some 44 businesses involved in alternative and appropriate technology issues such as: * Environmental Information * Waste Water Treatment * Water Supply & Purification * Air Pollution Control * Waste Management * Recycling * Soil Preservation * Noise Protection * Power Generation * Energy Efficiency. An Indonesian not-for-profit and independent organization aiming at implementing sustainable development concept and assisting various conservation efforts. Human beings have always been the focus of WALHI’s fighting in defending the environment. Local communities and indigenous peoples often become victims of unjust treatment under the name of economic development. 1. helped grow awareness of environmental issues and promote the sovereignty of local communities and indigenous peoples in managing natural resources. 2. become the vanguard of the environmental movement in the country and become a significant part of the global environmental movement. 3. advocated problems of marginalized people to the attention of the lawmakers, who in turn take grassroots problem into consideration when deliberating laws. 4. supported the struggle of grassroots communities of maintaining their rights to a healthy environment and to self-management of the natural resources. 5. become the major source of information about environmental problems in Indonesia for the press, industry and lawmakers. The Indonesian chapter of the WWF For Nature, an independent conservation organization. Includes e-card, merchandise, news and online activity kit. ProFauna Indonesia is the only animal protection organisation in Indonesia which has a membership system, with members making a significant contribution to voluntary activities and enabling the organisation, despite limited staff, to achieve a great deal more than otherwise would be possible. The majority of ProFauna’s work involves campaigning for the protection of wild animals, investigation into the trade in wild-caught animals and animal rescue, all using non-violent means. ProFauna Indonesia has conducted numerous investigations into the trade and exploitation of Indonesian wild animals. Grant making foundation for programs in the area of Indonesian biodiversity conservation. Rufford Small Grants for Nature Conservation (RSGs) were set up in 1999 by The Rufford Maurice Laing Foundation. They are available to individuals and small groups and aimed at small conservation programmes and pilot projects. We generally look for projects of about a year’s duration. Applications from non-first world countries are strongly encouraged. On this page of the website you can track the progress of supported projects from Indonesia, and download application documents for new projects. 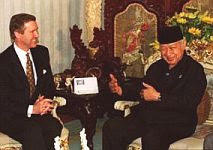 Global Forest Watch has downloadable reports and maps which examine the destruction and systematic plunder of Asia’s greatest rainforests under former Indonesian president Suharto. During his 32-year rule, Indonesia lost at least 40 million hectares of forests, equivalent to the combined size of Germany and the Netherlands. Concentrates on research and publications about tropical forestry and sociology in developing nations. Research abstracts, publications, job opportunities and software downloads. YLL (Yayasan Leuser Lestari), an NGO based in Medan, North Sumatra. YLL focuses on monitoring forest practices in Aceh and North Sumatra. Hakiki, an NGO based in Pekanbaru, Riau. Active in providing data and information related to the two main pulp and paper mills that operate in Riau province and timber smuggling to Singapore and Peninsular Malaysia. Ulayat, an NGO based in Bengkulu. Ulayat leads campaigns to combat illegal logging in Bukit Barisan Selatan NP, Bengkulu and Kerinci Seblat NP, Bengkulu. ARuPA, an NGO based in Jogjakarta specialising in research and investigation of the state own forest companies performance and promoting an alternative regulation on community-based forest management. YASCITA, an NGO based in Kendari, South East Sulawesi, active in monitoring the illegal logging activities and promoting the alternative regulation on community-logging. YASCITA also set up the alternative media such as environmental radio and Kendari TV. Other partners are including AMAN (national forum for communities), Forest Watch Indonesia, PASe (Aceh), Sylvagama (Central Java), LPMA (South Kalimantan), BLPM Lakpesdam (South Sulawesi), Jurnal Celebes (South Sulawesi), Yalhimo, Triton, Perdu (West Papua), and many others. Telapak is an independent environmental non-profit group based in Bogor, Indonesia. Telapak and their partners acrossing Indonesia archipelagos has been very serious involved in forest crime monitoring and continued by FLEGT VPA monitoring process. Eyes on the Forest is a coalition of three local environmental organizations in Riau, Sumatra : WWF Indonesia’s Tesso Nilo Programme, Jikalahari (Forest Rescue Network Riau) and Walhi Riau (Friends of the Earth-Indonesia). Eyes on the Forest aims to become a clearinghouse for information on forest conservation in Riau, Sumatra and to serve as a tool for local, national, and international NGOs, companies, governments and any other stakeholders who are willing to take action to conserve forests and protect the rights of the local people who rely on them. A pilot project created in 1996 by European Union and the Indonesian Ministry of Forestry to develop a replicable example of sustainable forest management in Indonesia. Network made up of twelve NGOs from four provinces in Sumatra whose focus is biodiversity conservation and community development. Get a sticker like this here.